Top mom blog for better family life by Nashville blogger. With gluten sensitivities plaguing many of our friends and family members, you might find yourself cooking for those with high gluten intolerance this holiday season. Thankfully, there are a multitude of gluten-free recipes out there for pretty much anything you want to make if you know where to look. If you’re looking for a flatbread recipe, look no further! This gluten-free flourless artisan flatbread is savory, cheesy, gluten-free, overall delicious, and very versatile! Not only does it make a delectable flatbread, it’s works wonderfully as pizza crust, breakfast sandwich bread, and bruschetta. My mom tried the recipe out and told me that it was the perfect style bread for dipping in her chili and pairing with spaghetti! While most gluten-free recipes substitute gluten-free flours for normal bread flour, this recipe doesn’t use any flour at all. Instead it calls for only almond meal, or “almond flour”, which is still just ground up almonds and in no way actual flour. This way, the bread has way less carbs and way more protein than the norm. Healthy and scrumptious! Place the cream cheese, eggs, Parmesan, almond meal, baking powder, and garlic in your food processor and process until the contents are smooth and thoroughly blended. Add your seasonings, stir it up again. Then, add the shredded cheese. Pulse to mix it in. 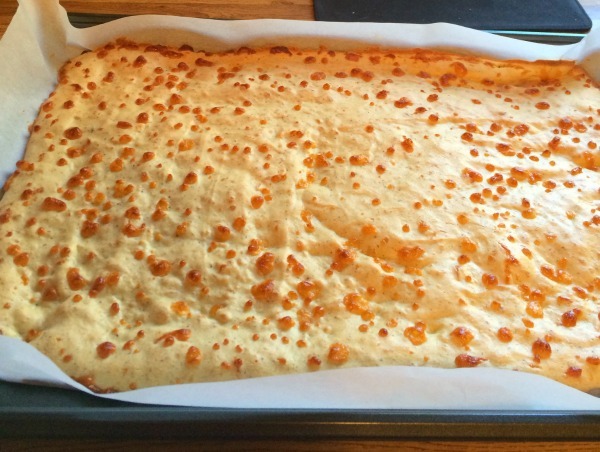 Line an 11 x 17 in pan with parchment paper and spoon the batter inside in an even layer. (Trick: cover the batter with plastic wrap and press it evenly through the pan with your fingers). Remove the plastic, and put in the oven to bake at 350 degrees for 20 to 30 minutes until browned. Release from the oven and while it’s hot, brush the top with olive oil. Remove flatbread from the pan and place on a cooling rack. The original recipe is Sherrielee’s Artisan Flat Bread, and instead of 1 ¼ cup almond meal, it uses only a ½ cup almond meal and supplements it with ¾ cup bake mix. Since we were fresh out of bake mix, we food-processed almonds to make our almond meal, and replaced the measure of bake mix with simply more almond meal, and it worked really well! This gluten-free artisan flatbread has a lovely crunch, and will suit those of you who like thin-crust pizza and a nice crisp bread. It freezes well, so making this ahead of time will set your mind at ease when it comes to dinner planning for gluten-intolerant guests! Have you tried baking gluten-free recipes yet? Thanks for reading Family Focus Blog, which has been named among the most popular family blogs. It was created by Nashville mom, Scarlet Paolicchi, to be a resource for better family life, parenting tips, family fun activities, eco tips, family food ideas, family travel, and home decor. Family Focus Blog has been named #3 in Cision PR’s 50 U.S. Top Mom Blog list. I LOVE This Wooden Wall Map From My Sponsor! Don’t you? Family Focus Blog is a participant in the Amazon Services LLC Associates Program, an affiliate advertising program. We also accept forms of cash advertising and sponsorship. We disclose material relationships and share honest opinions. © Scarlet Paolicchi and Family Focus Blog, 2010-2019. Short excerpts may be used, provided that full and clear credit is given to Family Focus Blog with link back to the original content. Duplicating a whole post is strictly prohibited.